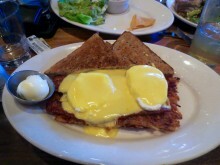 It’s called Hash Browns Eggs Benedict and it is so simple that I couldn’t believe I had never seen it on a menu before. It’s literally eggs benedict on hash browns instead of English muffins. Moreover, you can get bacon instead of ham, which I did. More moreover, it comes with toast if you still want something bready. And it is truly amazing. Unlike home fries that sometimes pass themselves off as hash browns, these are the real deal – shredded, sometimes crisp and always delicious. The bacon was also perfectly crisp and thick, while the eggs were runny and the hollandaise sauce was, well hollandaise sauce. No doubt, this was a solid spot for some brunch. I say this not only because I assume everything on the menu is as good as the Hash Brown Eggs Benedict, but because everyone else loved the hell out of their meals as well.